A simple water feature can make a large impact even in small spaces. The addition of a container water garden will transform, beautify and diversify your existing garden into an oasis that brings relief during the dog days of summer and beyond. Sit back, relax and enjoy the melodious sound of dancing water from your garden pond, and it will provide soothing, background music to your summer retreat. Bring wildlife into the garden by incorporating fish, frogs and snails into your mini aquascape. A simple water feature may be placed in the garden, on a deck, patio or porch or even added to a rooftop garden for a tremendous impact in a tiny space. Container water gardens can be created from practically anything that has the capability of holding water or supporting a liner. 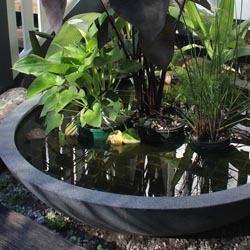 Ceramic sinks or tubs, half-barrels, buckets, pottery or planters and troughs can all be used to create beautiful ponds. Remember, these features will look their best when the shape and materials are similar in style to that of your home and surrounding gardens. If you have chosen a whiskey barrel or other similar wood container, follow these simple instructions to incorporate a liner to waterproof the container. Center your flexible liner over the whiskey barrel or other container. Push down in the center so excess material is evenly spaced over the outside lip. Begin folding the liner over itself at 4 to 6 inch increments, working your way around the container and minimizing any bulges. Fasten each fold with a half inch staple placed about a half inch from the top of the container. Trim the liner so it is even with the lip of the barrel or container. Fill your container with water, and then arrange your aquatic plants and pump/filter system. Rigid pond liners are also available to insert into half whiskey barrels for ease of waterproofing these containers, but double check sizes to be sure you choose the right fit. With such a wide assortment available, pots and planters make great garden ponds when properly prepared. Plug the drainage hole with a small piece of pond liner spread with caulk. Seal any minor cracks with caulk. Paint the inside of the container with a water garden sealant. Properly lined, your container will hold water easily without slow leaks that can traumatize plants and destroy your water garden. The use of aquatic plants will help you avoid the need for algaecides by reducing pond algae in two ways. First, aquatic plants remove excess phosphorus and nitrogen from the water. Second, plants shade the water from sunlight, thereby inhibiting algae growth. For a healthy balance, cover half of your pond surface with floating plants for shading. Submerged plants should be planted at a rate of one bunch, 6-10 plants, for every 5 square feet of surface area. Marginal or bog plants will complete the ecological balancing act. Floaters: Water Lettuce (Pistia stratiotes), Water Hyacinth (Eichhornia crassipes), Frogbit (Hydrocharis morsus-ranae) and Miniature Water Lilies (Nymphae spp.). These plants provide habitat and will shade the pond water surface to reduce the production of algae. Submerged Oxygenators: Anacharis (Elodea Canadensis), Water Buttercup (Ranunculus aquatilis) and Fanwort (Cambomba caroliniana) are great choices that help maintain water clarity by consuming excess nutrients that contribute to the production of algae. 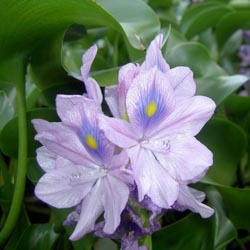 These plants can reproduce rapidly, but they are easily controlled in the small pond by simply removing surplus growth. Marginal Plants: Sweet Flag (Acorus spp. ), Dwarf Cattail (Typha minima), Dwarf Papyrus (Cyperus profiler), Iris (Iris pseudacorus) and Camelion plant (Houttuynia cordata). Placed at a pond’s edge, these marginal aquatic plants add color, height and variation to the water garden. They also provide cover, habitat and oxygen. Be careful not overwhelm your container water garden with too many plants or it will be difficult to maintain a natural balance. Different types of wildlife will love to be a part of even a small water garden. Fish: Fish create additional interest to a water garden by adding sparkle and movement. 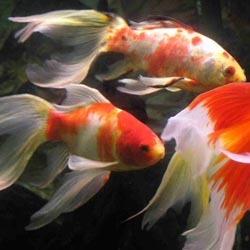 Good choices for a small water garden are: Goldfish, Red Comets, Calico Fantails and Shubunkins. Do not overstock your water feature. As a rule of thumb, each inch of fish should have 6 square inches to one square foot of water. Snails: Slow and steady, snails can help keep your water garden clean and healthy. Japanese Trapdoor Snails eat algae stuck to the sides of the pond and will consume excess fish food. Tadpoles and Frogs: Tadpoles will morph into amusing frogs. Tadpoles eat algae and add motion and interest to the pond, especially for children. Frogs will lend sound to the garden and aid in insect control. Several common problems can occur even in small water gardens, but they are easily controlled and you can keep your water garden looking beautiful. Algae: Despite all your planning, it is perfectly natural for your pond to turn green at first. Once the plants get to work, the green will fade. If you find that you require a little extra help in algae control, try Microbe-Lift or Barley Straw pellets, both are natural algae controls. Adding an extra snail or other algae-eater to the pond can also help control the color naturally. Mosquitoes: Mosquitoes may be managed in several ways. Adding water movement to the pond with a pump and small fountain will keep the insects from breeding or settling on the water. Adding BT (Bacillus thuringiensis) to the water in the form of Mosquito Dunks will also discourage the insects. Incorporate small fish into your pond garden, they eat mosquito larvae. Other mosquito predators include: dragonflies, bats, tadpoles and frogs, all of which can be a part of your backyard ecosystem. Check the pond weekly. You need to be observant to animal activity and any abnormal growths or marks. 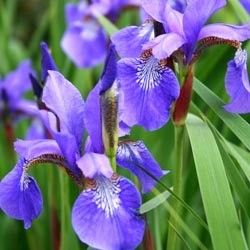 Inspect plants and fish for health, insects or disease. Clean up any dead or yellowing foliage. Replace evaporated water as necessary. If your water contains chlorine or other chemicals, be sure they are removed before adding this water to your pond. Chlorine is toxic to fish and beneficial bacteria. Chlorine will dissipate after a few days if it is exposed to air, but do not add fish or plants until after this is accomplished. With just a little thoughtful planning, the right plants and proper care, you can have a small water garden to brighten up a small space in your yard.